The Dragonfires were a barrier against invasion from the Planes of Oblivion that were created from the blood of Akatosh and given to Saint Alessia. The fires were relit whenever an heir ascended to the Ruby Throne. They were kept burning throughout his or her lifetime and represented the Covenant between the Cyrodiilic Empire and Akatosh. According to legend, the Dragonfires protected Nirn from Oblivion. 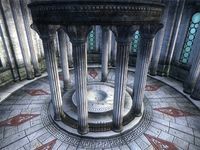 The pedestal that served as a pyre may be found in the Temple of the One in the Imperial City, though there seems to have been no apparent connection between the ritual and the Alessian teachings. A Dragonborn Emperor had to use the Amulet of Kings to light the Dragonfires in the Sublime Brazier, a sacred cauldron located in the Dragonfire Cathedral deep beneath the Imperial Sewers. Once the Sublime Brazier was kindled, it would light the Dragonfires in the Temple of the One. The Dragonfires could also be lit directly from the Temple of the One. The darkening of the Dragonfires played an essential role in two Daedric invasions of Tamriel. The first occurred in 2E 579, when Emperor Varen Aquilarios of the Empire of Cyrodiil misused the Amulet of Kings in a ritual that Varen's advisor Mannimarco had convinced him would curry Akatosh's favor and make Varen a Dragonborn. Instead, the ritual violated the Covenant with Akatosh and caused the Soulburst, which set Nirn adrift in the Mundus. Molag Bal took the opportunity to begin rending the souls of Nirn's mortals from their hosts to use as fuel for the Planemeld, the process of merging Nirn with Coldharbour using devices called Dark Anchors. Fortunately, a Soulless One who had been a victim of Mannimarco and Molag Bal's schemes arose to unite the warring nations of Tamriel against Molag Bal, invading Coldharbour and halting the Planemeld in 2E 582. The Soulless One also later stopped an alternate form of the Planemeld ritual called the Planemeld Obverse from being carried out by the Xivkyn Molag Kena at White-Gold Tower. With the ascension of Tiber Septim as Emperor of the Third Empire at the end of the Second Era, the Dragonfire ritual was resumed while the Septim Dynasty reigned, but in 3E 433 that dynasty was broken and Mehrunes Dagon threatened Tamriel with an invasion of his own. With the assassination of Emperor Uriel Septim VII and all of his legitimate heirs by the Mythic Dawn cult, no known Dragonborn heir remained to relight the Dragonfires. The barriers between Oblivion and Mundus were broken, allowing stable portals to the Deadlands to be created. When Martin Septim, the illegitimate son of the late Emperor, smashed the Amulet of Kings to summon an avatar of Akatosh, the barriers were resealed permanently, thus ending the long but now obsolete tradition. This page was last modified on 22 March 2019, at 00:54.